Since I have been living in Bangkok I get regular emails about what’s on. I don’t do that much on a regular basis but sometimes I see something that catches my eye. So one Friday-my only day off- I got up early and was in the pool by 8.30am, followed by my regular exercise workout, had breakfast and was out the door at 10am. I went to Thai lessons, which is what I normally do on Fridays, and afterwards I took myself to the Queen Sirikit National Convention Centre where they were holding the “Bonjour Fair”- a French and Italian market. These types of events always intrigue me because I think it’s strange that you would get such a thing in Thailand. 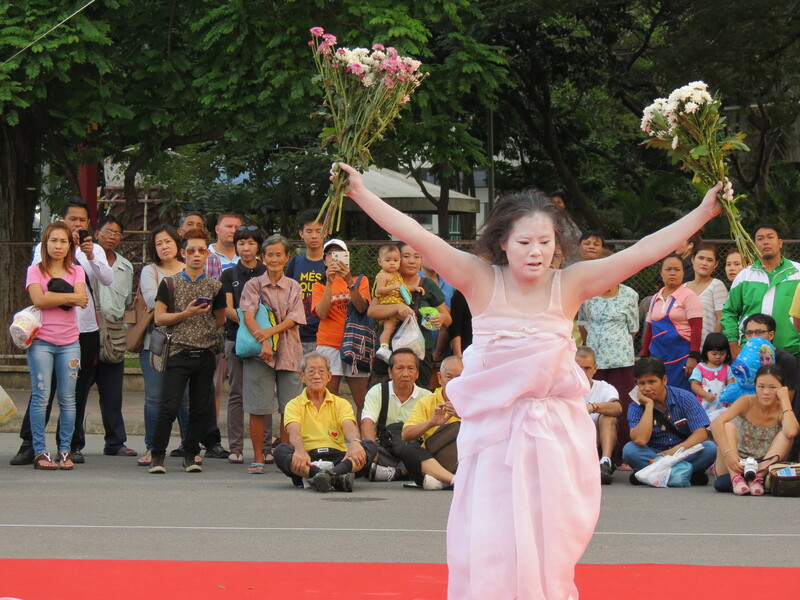 But Bangkok is an international city so of course these types of events happen here. I still find it strange. (Or maybe it is me who is strange!?) Anyway, I arrived and wandered around, bought a ham quiche and left. I only really went to check it out and as I didn’t have much money to buy all the delicious things I wanted to buy (Umm wine!) I didn’t hang around long. 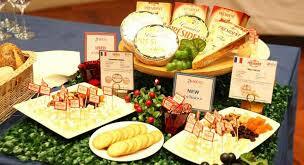 There were lovely offerings to be had- cheese, wine, bread and meats. There were also shoes and perfumes. 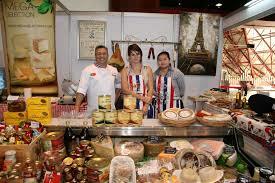 All the things you would imagine would be at a French and Italian market. You could even try before you buy. I believe this market happens once a year. 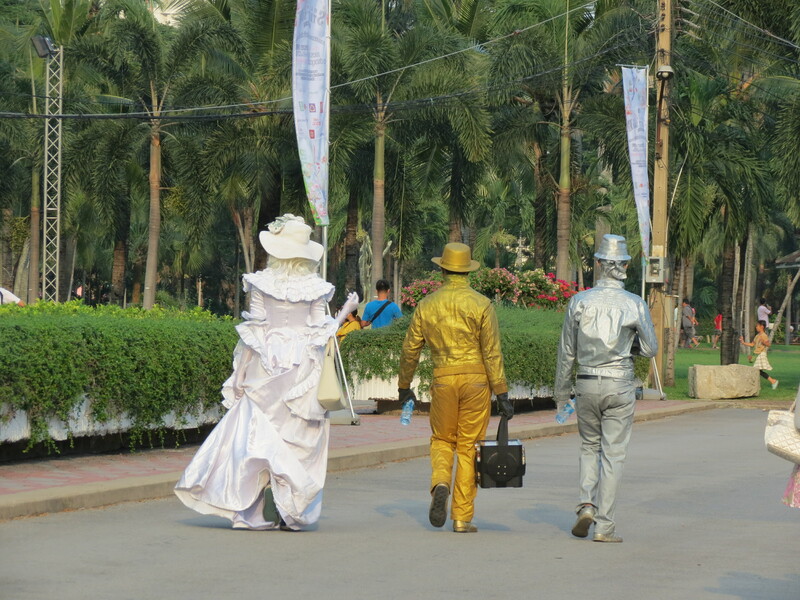 The next thing on my agenda was to go to Lumpini Park to see the Bangkok Street Fair. After a quick trip to do some Christmas shopping, I got to Lumpini and meandered around watching the variety of street performers. There weren’t many people there when I arrived so I could easily watch the performers that were dotted around the park. There were mime artists and trapeze artists but the best ones were a group of guys dancing and doing the limbo. They had attracted quite a crowd. 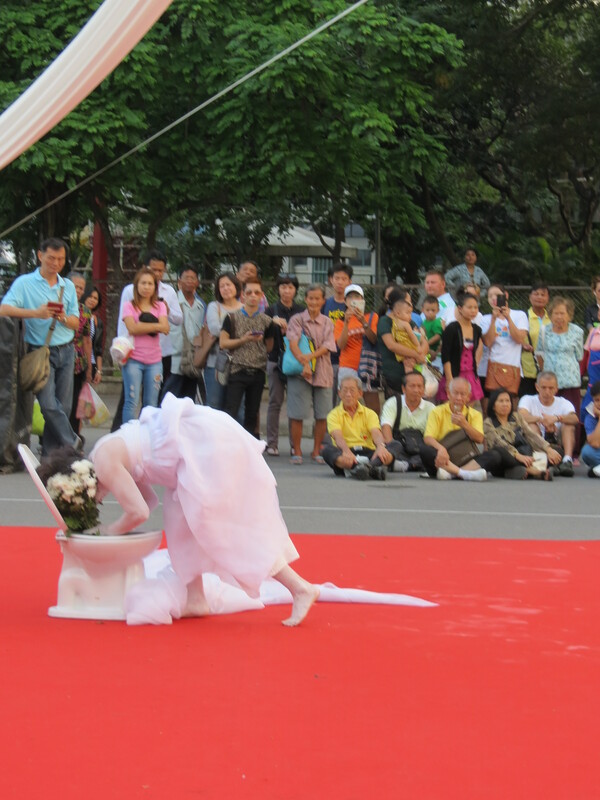 On the way out I stopped to watch a woman doing her piece, which included a toilet and some flowers. I have no idea what that was all about but when she stuck her head in the toilet it reminded me of Renton in “Trainspotting.” I walked out of the park chuckling to myself. On the way back I stopped off at Onnut night market for somtam and a beer. I deserved it after my busy day. I hadn’t been there for a while and, although the prices have gone up a little, it is still a place I enjoy especially when the lady, who sells the somtam, recognized me, and I got a beer by simply mouthing the word “Singha” to the waitress. 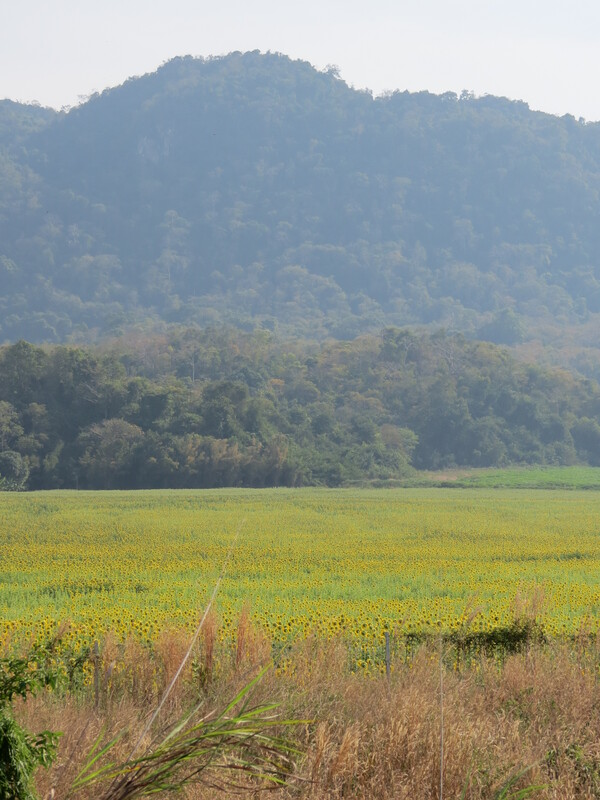 My friend and I went to Saraburi to visit a local tourist attraction-sunflower fields. Doesn’t sound that exciting? Believe me it is worth the effort of getting there and even more so because we decided to skip the organised day trips from Bangkok and do a DIY version instead. We left Bang Sue at 9.20am- the train should have left at 8.20am but hey this is Thailand. 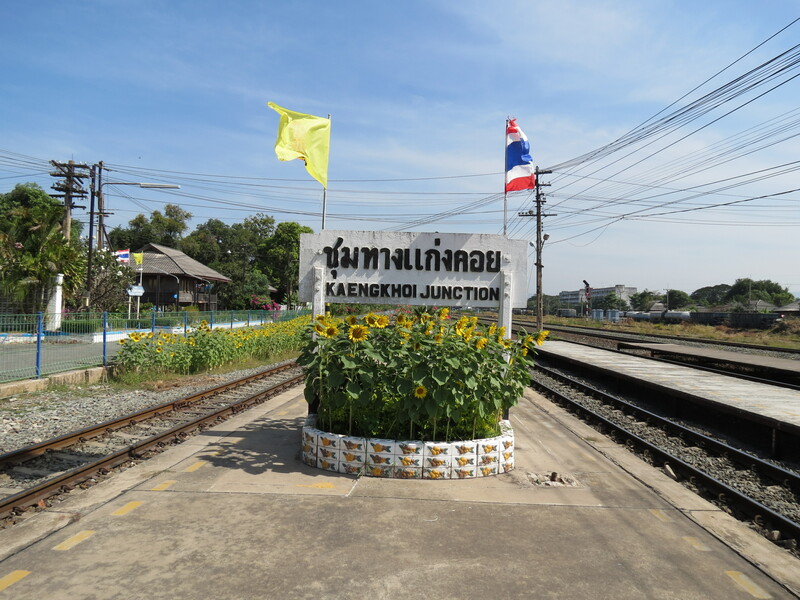 We travelled an hour and a half north to Khaeng Koi Junction where we changed trains for a thirty minute journey to Hin Son. Hin Son is literally in the middle of nowhere. 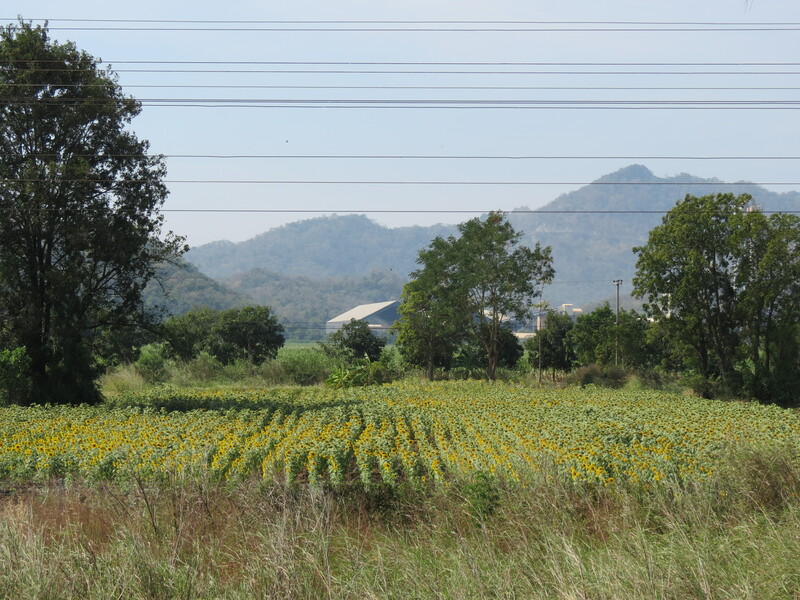 We had co-ordinates to follow and we had been told that the sunflower field was in the direction away from the school and towards the temple. That’s all we knew, and without ACTUAL GPS we walked for about 10 minutes to a temple we had spotted and decided that we were going in the wrong direction. Luckily, we had seen some sunflower fields from the train, so we walked back to the train station-getting some bemused stares from the locals. On the opposite side to the station was a road but we agreed that it didn’t look like it went to the fields-we found out later it did-so we decided to walk back along the train track. Actually, we started walking through the fields but the grass started to get very long in places and we were scared that there may be snakes. A snake bite in the middle of nowhere would lead to certain death- maybe a bit of an exaggeration but a snake bite would be very serious, to say the least, considering one of us would have to leave the bitten party to go in search of help. Not a very sensible idea. So we backtracked a little and started walking along the train track. 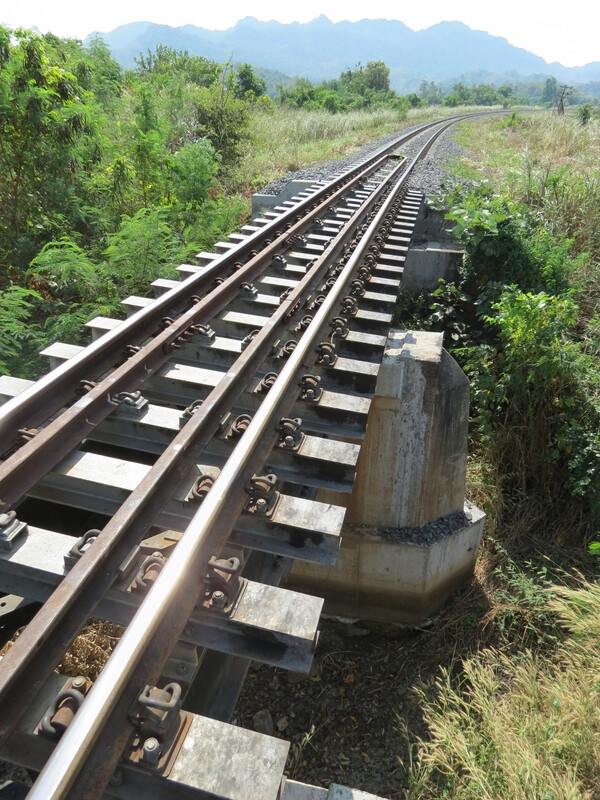 There are only three trains a day and we didn’t see one but we were constantly checking in both directions and we were ready to dive off to the side of the track if one came trundling along. We arrived at the sunflower field with no scrapes- even though we had to scramble across the track with a 12 foot drop below. In our imaginations that drop was 1000 feet. We were a little burnt and our feet were sore from walking on the track. On either side of the train track there are fields and fields of beautiful sunflowers. It’s very peaceful, right in the middle of nowhere. There was no one else there apart from a couple of people who arrived in a van who, like us, had come to see the sunflowers, and a few stallholders who were setting up their stalls for the weekend rush of people arriving on the train. We basically had the place to ourselves. We wandered around taking photos and then we went and rested up a while in the shade with some sunflower juice to quench our thirsts. We both looked at each other, jungle? The train goes that way so we thought it was safe to say there wasn’t any jungle going to block our way. So off we went walking along the train track again. After a while we suddenly realised that the road was running parallel to the track but there was no way that we were going to get to it because the undergrowth was just too thick. So we continued along the track. Every few minutes we could hear lorries passing by on the road but we thought it was a train, so we stopped in our tracks (get it) and were ready to dive to safety. But all was ok. How we misjudged the distance between the hut and the sunflower field I still wonder today. We were sure it was closer. We kept walking and walking with nothing but train track in front of us. In the end I spotted a way off the train track to the road. It’s a good job I saw it because we were chatting to each other and could easily have missed it. But we swapped track for road. At least it was easier to walk on. After a good fifteen minutes we finally saw a sign that said railway crossing. At the same time a guy stopped on this motorbike and was asking us where we were going and where we had been. Typical. We had been walked for what turned out to be 5 km when someone saw us and told us where we were supposed to be going. This guy, whose name was Mr. Praset, asked us if we wanted to go to his house and sleep the night. We gathered that he ran some sort of homestay. 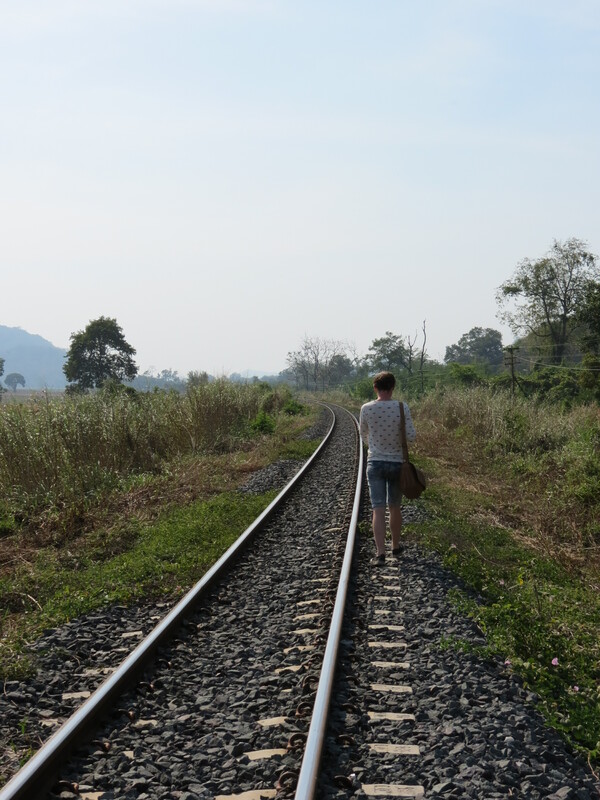 We politely turned him down and said we would wait for the train back to Bangkok. Off he went and we sat by the road. About fifteen minutes later he came back with bananas, a packet of chocolate biscuits, and a bottle of water each for us. He sat there and chatted away to us for ages. He asked us if we wanted a lift to Khaeng Koi but, again, we politely declined and said we would get the train. 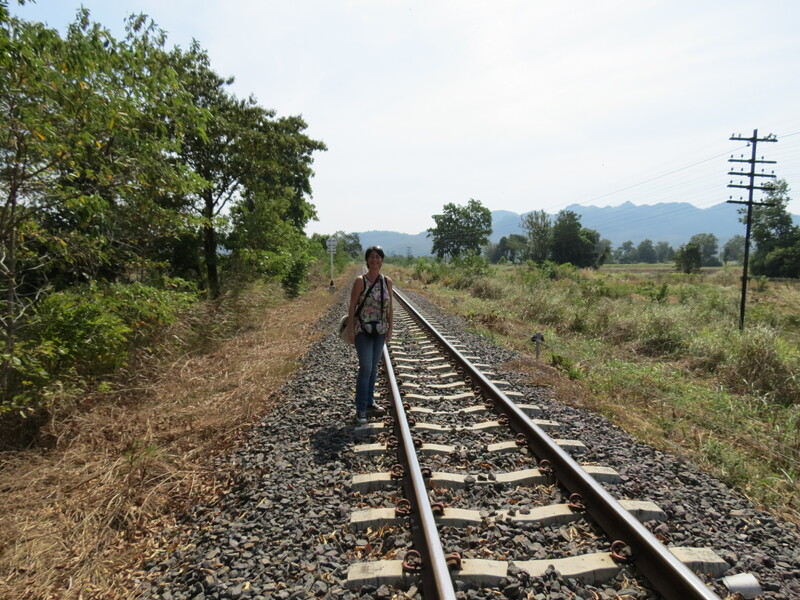 Off he went again and we moved to the hut that is the train stop in Khao Hin Dad. Some more people arrived, this time to just sit and stare at us- quite amusing really. Mr. Praset came back again-this time in his truck- and asked us again if we wanted a lift to Khaeng Koi because he didn’t think we would make it in time to get the train back to Bangkok. As much as we wanted to get the train back, we also didn’t want to miss the train from Khaeng Koi, so we agreed and got in his truck. So we were off back towards Khaeng Koi but not before going back to Mr. Praset’s home. He wanted to show us where he lived. We literally drove into the drive, said hello to his daughter, and reversed out again. From what we saw it looked lovely and we found out that he exports flowers to China from the fields at the back of his house. But we suspected that he only wanted to show off his new “farang” friends to his daughter. We arrived at Khaeng Koi and offered him some money for the ride. He told us before that it would cost 100 baht each but he did not accept anything from us. This is one of these random things that happen and it’s been a long time since anything like this has happened to me. 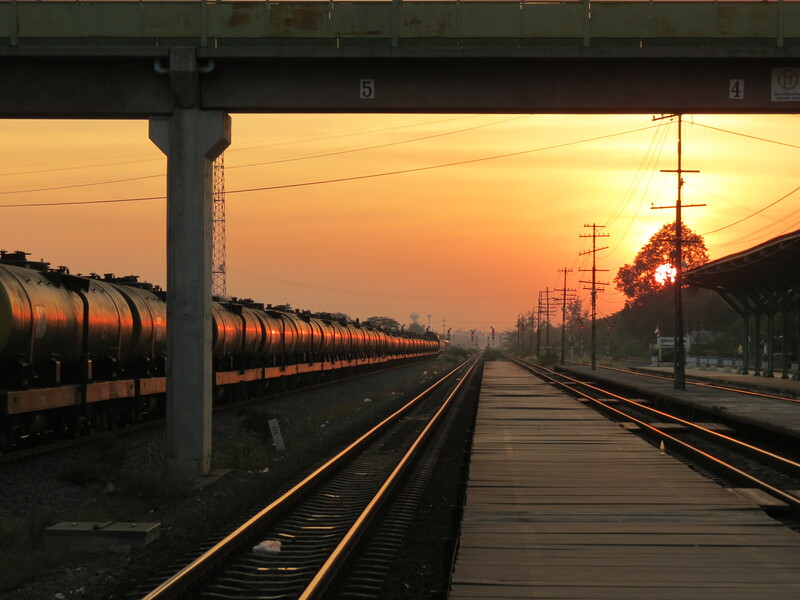 While I don’t want to be walking along any train tracks, with seemingly no end, for a while, I loved meeting Mr. Praset and will definitely be paying him a visit when I am next in that area. As for the DIY day out to visit the sunflower fields- I would not have missed it for the world. On my tour of New Zealand a few years back I visited Tekapo which is located on the South Island. When I arrived it was covered in two metres of snow and I realised it was a small place with not really that much to do when you compare it to somewhere like Auckland or Queenstown. But it was a charming little place nonetheless. It is nestled among some spectacular mountain ranges and on the banks of Lake Tekapo. The town consisted of a few shops, one pub and a supermarket. I didn’t want to stay in my accommodation and cook for myself so I walked up to the pub where I spent a few hours drinking beer. After a while I went outside to have a cigarette and started talking to this guy, Corley. He invited me to join him and his mates. These interactions are great but it depends on how I am feeling at the time as to whether I will take the offer up. Sometimes I just want to sit by myself but this was not one of those times. I played pool with the guys. Not just any pool but the best pool I have EVER played in my life and ended up having a great night. One of the guys called Christian was the biggest guy I had ever seen. Huge, like a rugby player. He was hilarious- he kept saying sorry to me when he had a bad shot and he was drinking out of a glass, smaller than a half pint glass but because he was so big it looked like he was a giant and the glass was a pint glass. I was dying to say that to him but felt it was better to keep that amusing little thought in my head. Christchurch is a lovely city with lots to do. On my first night I had a wander to get my bearings followed by dinner and drinks. The next day I had a cultural day- arts centre, craft market, museum and botanic gardens. I visited the Antarctic Centre which is very interesting The centre tells you all about what is going on in Antarctica and you can see daily pictures from Scott Base there. There is information about the history and why the projects over there are so important. You can also experience what the weather is like there in the “storm room”. The room is -8 degrees normally and when they start the wind up to 46km/h, the temperature goes down to -18 degrees. It was absolutely freezing even though we were kitted out in thermal trousers and jackets and had our faces protected. It was positively tropical when I came out of there. In Antarctica it can get as cold as -80 degrees and if you were not prepared for the conditions you would die within one minute. I took a day trip from Christchurch to Akaroa- a very pretty little village town located in between some beautiful green countryside. The town is so small you don’t really need a lot of time there and I was there for the day, so after I had wandered around and taken some photographs and then walked to the lighthouse, I decided to go on a harbour cruise to while away a few hours. There was all manner of nature on that boat trip-seals, penguins and little hector dolphins. As a nature lover I was in my element and tried to take as many photographs as I could but the animals were darting here and there in the water so quickly that it was hard to take any decent photographs. Orana wildlife park is another good day out. It’s like a safari park but it is a zoo. Let me explain- the animals are in enclosures (like a zoo) but they are large, open enclosures so the animals have more freedom and can act more naturally (like a safari park). It’s one of the best I have been too. All that separates you from the animals is a moat and electric fencing-apart from the big cats and wild dogs for obvious reasons. You can hand feed the giraffes which, I thought, was quite cool so I asked the keeper to take a photo. She didn’t manage to get a proper one so I took one of myself and the giraffe- I am not sure who looked better (it looked like we had been separated at birth). I found this quite amusing-little things always make me smile. Then to add to my amusement I got to the water buffaloes and found I was more interested in taking pictures of ducks and rainbow trout. Being on my own all that time I was bound to go a little mad. I did meet a human friend-Ian- he was the bar man in a little bar I found in Christchurch’s city centre. He was really friendly and he kept me company for a few nights while I was there on my own- even got me involved in the bars weekly quiz night (which I was rubbish at). It’s always nice to meet a friendly soul to chat to, especially when you are travelling alone. It beats ducks and fish any day. Next stop Kaikoura- a beautiful little sea-side town on the east coast of the south island. I went there to do some whale-watching but it was cancelled two days on the trot due to weather conditions- the weather in the bay was very pleasant and sheltered but the coastguard said that there were three metre swells in the open ocean. The whales were even heading off shore. If they were buggering off because of the weather, then I certainly wasn’t going out on a boat. The coastguard told me that there had been a trip the day before and everyone was sea sick. So I gave up with that plan and found other ways to amuse myself. I walked to the town’s resident seal colony- Peninsula Seal Colony at Kaimokehu. The New Zealand Fur seals, who bask on the rocks during the day were so close. I could have reached out and touched them. Obviously, I didn’t, I wanted to keep all my fingers. Just offshore lies the Hikurangi Trench and due to the trench’s steep sloping seafloor and currents, the trench provides nutrient rich water which attracts the seals, whales and other wildlife that frequent this area. 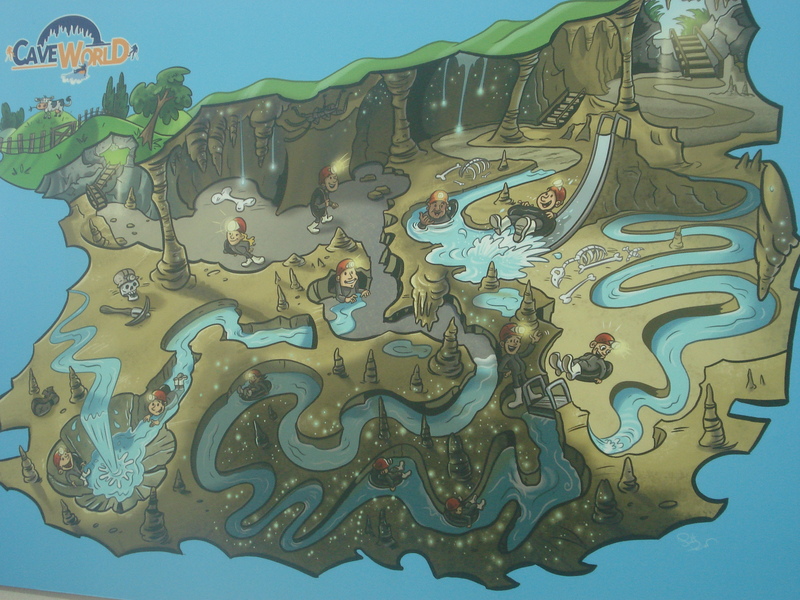 I walked back to town and went on a tour of the Maori Leap cave. The history behind this cave I found very interesting. It is a sea cave formed from limestone, which had a natural entrance to the sea but this collapsed about 6000 years ago. Bones found in the cave, thought to be from birds that used the cave, have been dated to around the same time. The name, Maori Leap, comes from a legend of a warrior choosing to either be captured or jump for freedom when a hostile group invaded from the North Island. He chose to leap. Another legend is of lovers who came from different tribes. They were prevented from being together and jumped to their deaths to be together forever. Afterwards, I went on a winery tour, which included a few tastings, YUM-wine, and a tour of their underground cellar, which they use for weddings and functions. I had a couple of glasses and bought two lovely bottles, one red and white. On the way back I came across a Thai restaurant so I decided to go in and have dinner. That was the first time I had been able to have Thai food without shaking and hyperventilating from withdrawal symptoms of Thailand! OK, that was a bit of an exaggeration but I did miss Thailand a lot. I thought that the food wouldn’t be as good but I was pleasantly surprised. I had yellow curry and it was delicious. I was so excited that I made a complete mess of the table. Then I got sad because it reminded me of Thailand. What a drama queen! I nearly had heart failure when I asked for a glass of wine and the waitress told me they didn’t have a liquor license. But she told me that I could “bring your own” (BYO), and lo and behold I had two bottles in my brown paper bag that I had bought from the winery. Drinking from a paper bag? What a lush. But no, thankfully she bought me a glass and I poured my own. It was quite amusing and I was chuckling to myself all the way back to the hostel where I finished off the wine. I spent three days there and during that time I walked up to the top of Mt. Mauao. It was quite steep in places but the views from the top are worthwhile. Afterwards , I went to the local outdoor pool and relaxed in the salt water pools to ease my aching bones. This place also offers excellent views of the Mount. The next day I left Mount Maunganui and headed to Whitianga, on the east coast of the Coromandel Peninsula. 12 km south east of Whitianga is Hot Water Beach, so named because of underground hot springs that filter up through the sand between high and low tides. Most visitors take a spade so they can dig large holes to wallow in the thermal water, which can reach around 64 degrees C.
Next stop- Cathedral Cove, or to give it its Maori name- Te Whanganui-A-Hei. A walk down from the car-park ends with this beautiful little cove and its natural rock formations- including Te Hoho Rock a natural rock stack which looms out of the blue water. Narnia fans will recognise this place as it is where the Pevensie children first re-enter Narnia in the movie- The Chronicles of Narnia: Prince Caspian. After Whitianga I arrived in Waitomo for a few days en route to Auckland. Alone again I decided to do some walking, so I opted for the 2km Waitomo Walkway. This is a real highlight of this area because the walk takes you over lush green farm-land, and shady forest, and the real beauty? I did this during New Zealand’s winter so there was no one else there-just me and nature. Although it was rather muddy, the walk is easy to navigate as there were marker posts with directions. 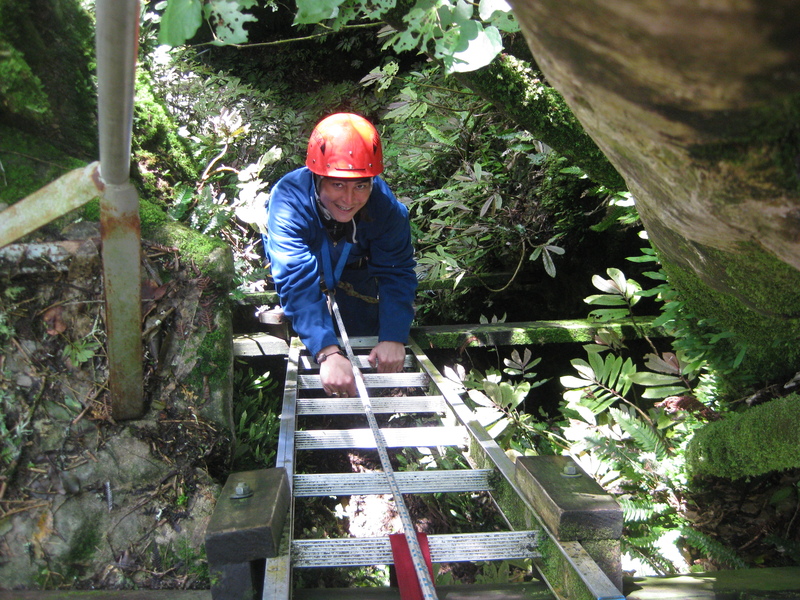 The track follows the Waitomo River to the Ruakuri Caves and Bush Scenic Reserve. The reserve has native bush, limestone outcrops, caves, tunnels, gorges and walkways high about the rushing water. Everything a nature lover could want. It’s a great way to experience the natural beauty of the place.There are viewing platforms where you can look down into the caves to see the huge stalactites and stalagmites. The next day I went cave abseiling. It was awesome. I abseiled 50 metres down into a limestone cave, climbed back up the ladder and down again. It was a bit scary to start with when you have to let go of the platform but I really enjoyed it. Then after some lunch I went Black Water Rafting or cave tubing- basically floating through the caves on an inflated rubber inner tube. I jumped backwards off a mini waterfall and went down a slide all in the darkness underneath the ground. And apart from the tiny glow worms that light up the walls, it’s mostly completely black and very quiet. Quite an eery feeling. Words cannot explain how thrilling it actually was. I loved my time in New Zealand, and I said before that I probably wouldn’t go back- a case of been there, done that. But I have since changed my mind and would love to go back one day. The scenery is just stunning and I truly had an amazing time there. My friend had already done one of these tours with Expique so I checked out their website and found this walking tour around Chinatown. I have never been to Chinatown in Bangkok before so I thought this would be a nice introduction. I had images of Chinatown having large streets with countless bars and restaurants- a bit like Chinatown in London, but we didn’t even hit the commercial area. Instead we meandered through the back streets for over two hours and learned a little bit of history. I met the rest of the group at River City Mall, a short motorbike taxi ride away from Suphan Taksin BTS. We were given a short introduction to the tour by Simon, who runs Expique, and then we were on our way. The first port of call was the Holy Rosary Church, also known as the Kalawar Church. The location of the church is on land granted to the Portuguese by King Rama l. During 1891-1898 the church was renovated and neo-gothic style towering spires were added. The interior has Romanesque stained- glass windows and a gilded stucco ceiling. Then we visited the Siam Commercial Bank. The Talad Noi branch of SCB is housed in a building that is 103 years old. King Rama V was very interested in architecture from abroad, so he commissioned Italian architect, Annibale Rigotti, to design this building and it was constructed between 1906-1910. Interestingly, Siam Commercial was actually the third bank to be opened here. In 1888 HSBC started the first bank and printed the country’s first bank notes. Chartered Bank (Standard Chartered) followed in 1894. It was Prince Mahisara Rachaharuthai that started the first Thai bank in 1904. 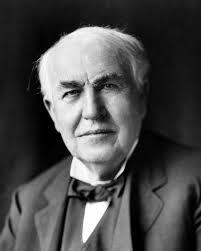 Siam Commercial was curiously called the “Book Club” before its name was changed in 1906. We continued onwards strolling along the back streets of Talad Noi (little market). We saw people in the community going about their daily business. We passed workshops of metal workers, and bakers; we saw people’s houses, and Chinese temples. We came across a doorway with red gates, and walls painted blue, with pictures on either side of the door. This house is over 200 years old and one of the families still lives there. We had a peek inside and all we could see was a swimming pool in the middle of the yard where people from a nearby hotel go to practise scuba diving. A case of old meets new! I had just finished saying that I wondered whether any tourists come this way when we came across a hotel. The River View Guest House appeared from nowhere. We went up to the roof top for splendid views across the Chao Phraya River. We stayed there a while and had a drink to quench our thirst while taking in the views. From our vantage point we saw a building to the right of the roof top bar. I was told it was a restaurant called Nang Gin Kui– a unique private dining experience in an architect’s apartment. You can enjoy a 15 course dinner either as part of a group or a more intimate dinner for two in the heart of Chinatown. After a while it started to rain so we donned our ponchos, kindly provided by Expique, and we returned to street level to continue our tour. The Vegetarian Festival was happening on that day and we went to a covered area where all the people were dressed in white and there were huge incense sticks burning, and drums thumping out music. We learned that the Vegetarian Festival has happened twice during 2014 which happens every 182 years. We were invited into a replica Chinese house to have a look and we got treated to some kids dressed up as a dragon. We continued through the streets and tried the delicious food on offer. Another temple and a visit to a rice making shop before the rain started pelting down again. We sheltered under a tin roof for a bit then made our way to the last location- the Chinese gateway that is located at the bottom of Yarowat Road-the commercial part of Chinatown. From here the tour ends but you are free to wander at your heart’s content. For me I had to dash off to Thai lessons. All in all I thought the tour was excellent. It gave some interesting information about some of Thailand’s history. And you will visit places that you will probably have never been to nor are likely to go on your own. I would definitely recommend Expique and I will be going on one of their other tours sometime soon. I am a single woman living in Thailand. I am interested in photography, culture, history, and travel amongst other things and I want to share my thoughts and experiences with you as I turn the pages of my life. I am passionate about all things Asian and I want to express this passion through my tales and photography from Thailand and other countries in the hope that you may be inspired to open your eyes to the world.